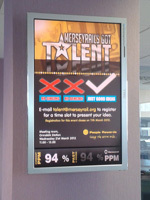 Merseyrail is an urban network of vital importance to the transport infrastructure of Liverpool and the region. They run almost 800 trains per day and carry over 100,000 passengers on an average weekday. As one of the most punctual and reliable railway networks in the UK, topping the passenger satisfaction levels league table, Merseyrail needed a well-coordinated corporate communications system to ensure that their high quality standards are known and respected throughout the business. 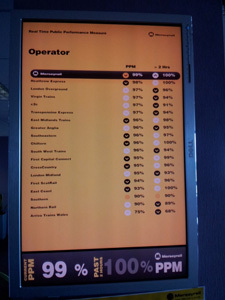 When approaching us, they already had the screens in place, the use of which was limited to displaying train time efficiency national ratings downloaded directly from a URL. While wishing to maintain an automated messaging system, they also wanted the ability to display a wider array of information. digitalsignage.NET allows them to do just that. Connecting the twenty digital information boards across the company’s offices, digitalsignage.NET enables headquarters to continue sharing real-time information while also publishing company news, events announcements and other relevant corporate communications on their screens. Many organisations struggle with finding efficient ways of conveying valuable information to their staff in the limited time they have available. digitalsignage.NET is a stable yet flexible digital signage platform that helps users to share messages instantly, ensuring that they are delivered at the right place and time. This entry was posted in and tagged corporate digital signage, digital signage advertising, digital signage software by Dynamax. Bookmark the permalink.